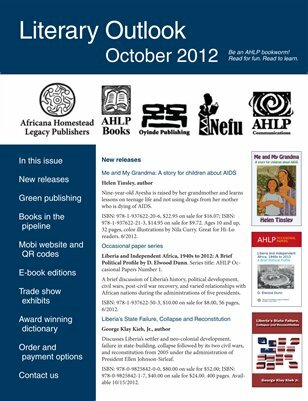 Africana Homestead Legacy Publishers newsletter with Fall news and sales. Latest releases: "Me and My Grandma: A story for children about AIDS" by Helen Tinsley. "Liberia and Independent Africa, 1940s to 2012: A Brief Political Profile" by D. Elwood Dunn. "Liberia’s State Failure, Collapse and Reconstitution" by George Klay Kieh Jr. Forthcoming books: "Practicing Prevention: How to Be Healthy and Whole," Pamela Payne Foster and Roland Barksdale-Hall, editors and contributors, Ruth Bradshaw Gordon, Thaddeus Ulzen, and Joyce Guillory. "Remarkable Lives of the Harveys, Spences, and Bonds: Free Black Family in Antebellum North Carolina, Business and Cultural Elites in Pennsylvania and Beyond" by Carolyn Cordelia Williams. Eco-friendly publishing. Info on mobile-friendly URL and QR codes. Trade show exhibit schedule. Order and payment options for individuals and institutions.